The covered entry is framed by an arched stone opening, and opens to a foyer space inside. To the left is a formal dining room with a decoratively shaped raised ceiling; straight ahead is a two–story high gathering room with a central fireplace hearth; and to the right is a centrally located powder room. Columns frame the openings, and divide the otherwise open floor layout. French doors in the gathering room look out to the covered terrace at the rear, and bring in plenty of natural light. The gathering room is open to the kitchen, which has a center island with an extended counter for eating, and a dining nook. A door from the kitchen leads to another covered terrace, making it convenient to dine outdoors, and it is connected to the terrace off of the gathering room. Off of the kitchen space is a stairwell, and a mud hall that leads to a walk–in pantry, a coat closet, a three–car garage, a laundry room, and a powder room. The powder room has a secondary door that opens to the covered terrace, making it easily accessible for those inside and outside. 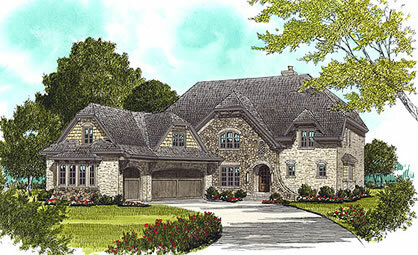 The right wing of the home is devoted to the master bedroom suite, which you access from the foyer. The master bedroom features a luxurious bathroom with a whirlpool tub, a separate shower, a toilet room, and two walk–in closets. The bedroom also has a door to the rear deck and covered terraces. After coming up the stairs, the upper balcony opens into a large loft space, which looks down to the gathering room. To the right of the loft are two bedrooms and a shared full bath, and to the left of the loft is a fourth bedroom with its own private full bath. There is also a media/recreation room, which is located above the garage. The media room is not included in the overall square footage, as it's essentially a bonus room over the garage, and thus much less expensive to build. This room is approximately 300 sf. The roof configuration of this house, accented with the wood brackets and fascias, gives the house a unique look, and it frames the individual windows below it. 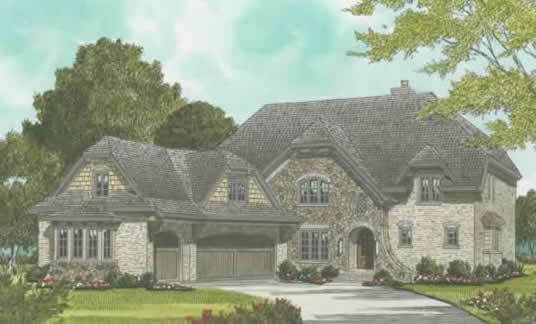 It's complemented by a combination of stone, brick veneer, and wood shingles. All of the living spaces – kitchen, nook, gathering room, and formal dining room – are open to each other. The gathering room has a fireplace that can be enjoyed from any of these rooms, a ceiling that's two–stories in height, and tall multi–paned windows flanking sliding glass doors that open to a covered terrace at the rear. In fact, there are two covered terraces at the rear of the house (the other is off the nook) that are connected by a deck.